1Thes 5:16-18 Rejoice always, pray continually, give thanks in all circumstances; for this is God’s will for you in Christ Jesus. We take too much for granted and don’t appreciate what we have until it is gone. I believe that one of the evidences of the Holy Spirit’s work in our lives is we become people who exhibit thankfulness for the gifts and blessings we’ve received. Thankfulness is more than just a sermon, a prayer, or even a feeling—it’s a way of life! This attitude of gratitude has a powerful effect on others around us. Psalm 9 is one of David’s psalms of thanksgiving. In this psalm of thanksgiving, he not only says, “thank you, Lord,” but he hints at three ways in which we can live a life of thanksgiving every day. First, David teaches us that thankfulness is a powerful way of witnessing about God’s goodness. David begins with these words in Psalm 9:1 I will give thanks to you, Lord, with all my heart; I will tell of all your wonderful deeds. David was on the run, surrounded by his enemies, but God kept him miraculously safe. David was so grateful he wasn’t going to keep his thankfulness between himself and God. He wanted to tell everyone he knew about the great things God had done for him. When we are under pressure, facing problems, persecuted, and still thanking God, we are a powerful witness to God’s grace and Spirit in our lives. After all, has a grumbling, complaining “Christian” ever lead anyone to Christ? No, but the persecuted, praising, thankful Church turns the world upside down! When was the last time you told someone what God has done for you? If we are truly grateful, then we will want to “tell of all His wonders.” That’s where evangelism finds its beginning. Someone once said, “I’m just a nobody, telling everybody, about Somebody, who can save anybody”. That’s a powerful attitude of gratitude. 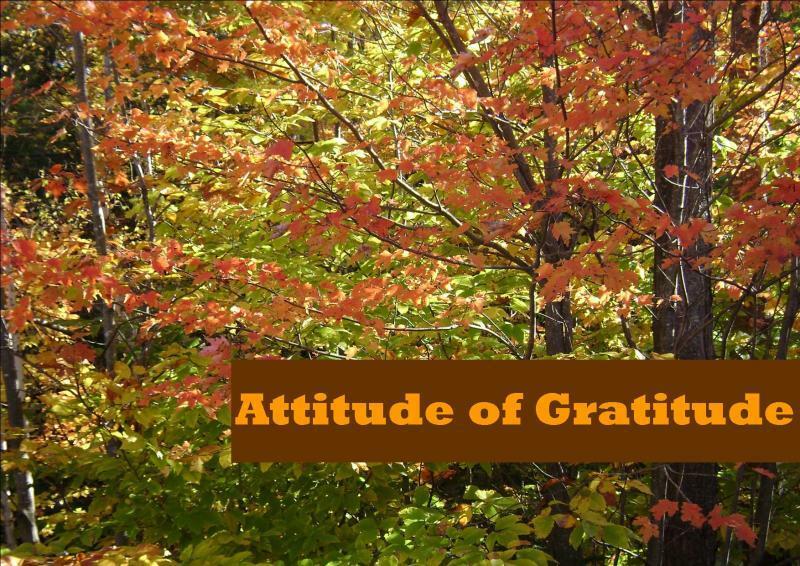 It is powerful because gratitude seems to be a lost virtue in our society today. Many people seem to think that the world owes them a living, and that they should have much more than they presently possess. Therefore, grateful people are astonishing, attractive, and refreshing in this selfish world. They stand out amid a crooked and depraved society. Phil 2:14-15 Do everything without complaining or arguing, so that you may become blameless and pure, children of God without fault in a crooked and depraved generation, in which you shine like stars in the universe. Furthermore, when we give the credit and thanksgiving to God, we direct others to the source of our blessings and gratitude. Today, because of the Internet and social networking sites, it is easier to express a heart of thankfulness to a large audience. What a wonderful way to witness to our friends, relatives, associates and neighbors—telling of all God’s wonders and blessings! Here is a simple example that someone expressed: “I’m thankful that God hasn't always given me what I thought I needed, because I'm often wrong. I’m thankful that God knows best, and that He is wiser than I am!” You hear that and you say, “Yes, I am thankful for that, too. I am glad they shared that.” Expressing gratitude has a powerful effect of redirecting others thoughts? Of course, other opportunities to witness require more personal interaction than Facebook, but they are still easy to do. The next time someone asks you how it is going, tell them what God is doing in your life through Jesus Christ! When you are in a conversation with someone, look for opportunities to introduce Christ into it. Jesus is the answer to most questions and topics of discussion. If you listen to the Holy Spirit, it will be easy enough, especially if you pray for guidance. With an attitude of gratitude, we focus on our blessings instead of the things we lack. To help maintain that focus, some Christians keep a prayer journal, a record of their prayers and how God answered those prayers. With this record, they have a reminder of God’s wonderful deeds in their life and how He brought them through each problem they faced. This reminder can cause the Christian to break forth in praise and worship towards God. David not only expressed his thankfulness by telling others about the wonderful things God had done, he also spoke to God about them—singing to Him and praising His name. David worshiped out of thankfulness. The Bible tells us to do the same. Ephesians 5:19-20 “Speak to one another with psalms, hymns, and spiritual songs. Sing and make music from your heart to the Lord, always giving thanks to God the Father for everything, in the name of our Lord Jesus Christ”. One of the most powerful examples of this is in Acts 16 where Paul and Silas journeyed to a Roman colony called Philippi. Acts 16:16-34 Once when we were going to the place of prayer, we were met by a female slave who had a spirit by which she predicted the future. She earned a great deal of money for her owners by fortune-telling. She followed Paul and the rest of us, shouting, “These men are servants of the Most High God, who are telling you the way to be saved.” She kept this up for many days. Finally Paul became so annoyed that he turned around and said to the spirit, “In the name of Jesus Christ I command you to come out of her!” At that moment the spirit left her. Imagine yourself in Paul and Silas’ place. First, they were stripped and flogged. After that, they were thrown in prison with their hands and feet fastened in stocks. At this point, most people would be crying, “Why, God? I didn’t do anything wrong! Don’t you love me?” but not Paul and Silas. Even after everything they’d been through, we read “Paul and Silas were praying and singing hymns to God, and the other prisoners were listening to them”. In spite of their treatment and surroundings, they had an attitude of praise, thanksgiving, and worship. That attitude had a powerful effect on those around them and it moved the hand of God. It doesn’t matter whether you’re sitting in a pew, or behind the wheel of your car, or around the family table, having a tune of worship in your head and song on your lips is a wonderful way to live and that attitude will affect others around you. When your heart is filled with gratitude, the overflow will pour out as thanksgiving and praise to God. Worshipping turns into another way of witnessing. Because Paul and Silas worshipped in the midst of their beating and imprisonment, God showed up. As a result, the jailer and his whole family were convicted and believed in Jesus. They were baptized and saved. The third way that David gives us to demonstrate our thankfulness is waiting—waiting patiently every day—to be more specific. We wait patiently on the Lord when we trust Him. Notice what David says Psalm 9:9-10 “The Lord is a refuge for the oppressed, a stronghold in times of trouble. Those who know your name will trust in you, for you, Lord, have never forsaken those who seek you”. Remember that David most likely wrote that during a time of great distress. He was on the run, hunted by King Saul, hiding out in caves, and living off what he could find in the wilderness. Yet, David was willing to wait on God for deliverance—to trust him, to lean on him, and take refuge in him. David did not attempt to kill Saul even when he had the opportunities. David believed that God would work everything out in His own time. David also wrote in Psalm 59:9-10, You are my strength, I watch for you; you, God, are my fortress, my God on whom I can rely. Whenever we become anxious, troubled, or stressed about life, it demonstrates a lack of trust and thankfulness toward God. It’s like we forget about everything God has done for us in the past, because we can’t see beyond the here and now. We become like the Israelites were in the Old Testament while crossing the desert to the Promised Land. The Israelites had witnessed all of God’s wonders—the plagues upon Egypt, the parting of the Red Sea, etc. Yet every problem they ran into caused them to panic, worry, and complain! They ran out of food, so they cried, “God you should have left us in Egypt!” A little while later, they ran out of clean water and cried out again, “God, we’d rather be slaves in Egypt than die in the desert!” When it came time to enter the Promised Land, they declared, “There are giants in the land; we can’t take it; let’s go back to Egypt.” They forgot God, who was with them as cloud in the day and a pillar of fire at night. They focused on their lack and their weakness rather than their blessings and their powerful God. We aren’t much better, are we? We worry. We complain. We forget how God provided for us the last time we got bad news. We forget He is present with us as the Holy Spirit. We also forget this “desert” we live in is not our Promised Land. We forget Jesus has gone to prepare a place for us. We forget that although we die, yet shall we live forever with the Lord. We must remind each other of our blessings and to be thankful. That is why we celebrate Communion each week, to remind us of how much God loves us and that He saved us through the atonement of Jesus Christ. We are reminded that we have covenant with Almighty God. He abides with us. We are the temple of His Holy Spirit. We are the Bride of Christ. We are God’s children and co-heirs with Jesus Christ. Since we have much to be thankful for, we should remind one another to express our gratitude with our words and life. Have you counted your blessings lately? Is eternal life, the forgiveness of our sins, and deliverance from an awful place, called Hell, among them? The blood that Jesus shed, the Holy Spirit, and the eternal life He gives, are the greatest gifts ever given. God has offered them to you. Have you accepted them? If so, be thankful. Let us say together, "Thank you, Lord!!". I also want to say “Thank you” to all of you who do the work of this church. Thank you for giving to the Lord and loving one another! Lives are changed in many places, and on many occasions, because you are giving, loving people, who reach out with the love of Christ to others. It is a joy serving the Lord with you. In summary, living a thankful and grateful life is essential to witnessing, worshiping, and waiting patiently on the Lord. An attitude of gratitude has kinetic power that effects other’s lives as we “go” wherever the Holy Spirit sends us each day. If there is anyone in this audience today who has never received the salvation Jesus has obtained for you, you have an opportunity today. All you have to do is receive it like that Philippian jailer did. Believe in Jesus and make Him your Lord by confessing Jesus as the Christ, the Son of God, who takes away your sin by His work on the Cross. Die to your old life through baptism so you can receive His righteousness and His life, the Holy Spirit. Jesus alone, by His precious shed blood, can save you and make you truly thankful.